I’m not sure how useful the information about travelling from San Pedro, Belize to Medellin, Colombia is. Surely it’s not one of the most popular routes in Central/South America. But you never know. Colombia seems to be the new place to travel. And even though I’ve only been here a few hours, I think I’m starting to see why.But let’s start at the beginning of my trip. 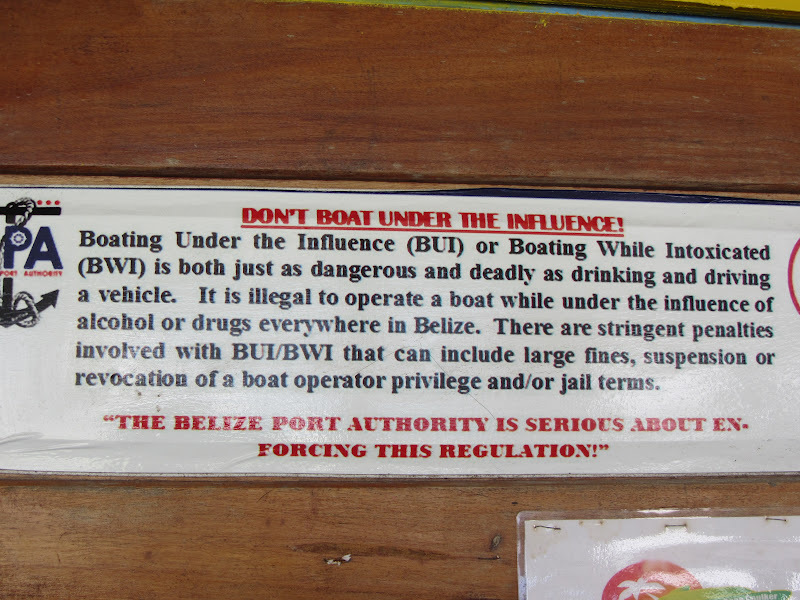 I’ve got to get out of Belize! And the cheapest tickets BY FAR to Colombia were through Cancun. I could fly for $320USD from Cancun to Ft. Lauderdale (overnight) to Medellin (on Spirit Airlines) or about $550 from Cancun to Panama City to Medellin (on Copa Airlines) but from Belize City? No ticket is less than $1000USD. So let’s get moving…I took the San Pedro Belize Express Water Taxi from San Pedro to Chetumal, Mexico Just last week, the country of Belize has implemented a new exit fee (for non-Belizean citizens and residents) that seemed quite steep and had more than a few tourists grumbling as they paid. The new exit fees, now $30bzd plus the usual $7.50bzd port fee are often more than the price of the ticket. My dwindling pocketbook was quite pleased, I am a resident and therefore exempt. Note on ticket price: If you are coming from Chetumal to San Pedro (Mexico to Belize) wait as long as you can to buy your ticket. (There is no need to secure a ticket in Playa or in Tulum.) Both companies (especially San Pedro Water Jets) are hugely competitive in Mexico, at the bus terminal in particular, and you can get a deeply discounted round trip ticket. I was hearing prices as low as $40 or 50bzd round trip. I was in San Pedro so I was charged the usual…$80bzd both ways.. The boat left and one hour, 45 minutes later we were in Chetumal. I hopped into a taxi to the ADO bus station. 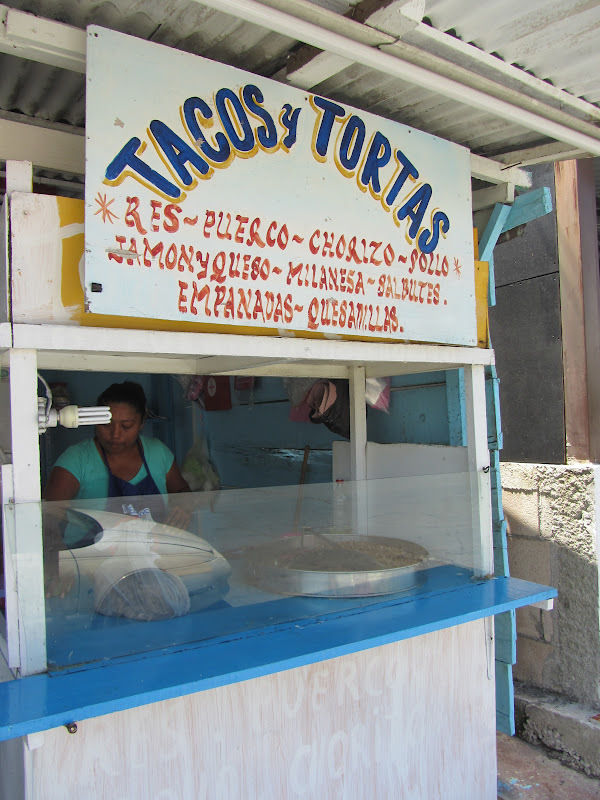 Packed with lots of junky bus food and snacks, if you want something a bit more Mexican to eat, head across the street to the little taco restarants. 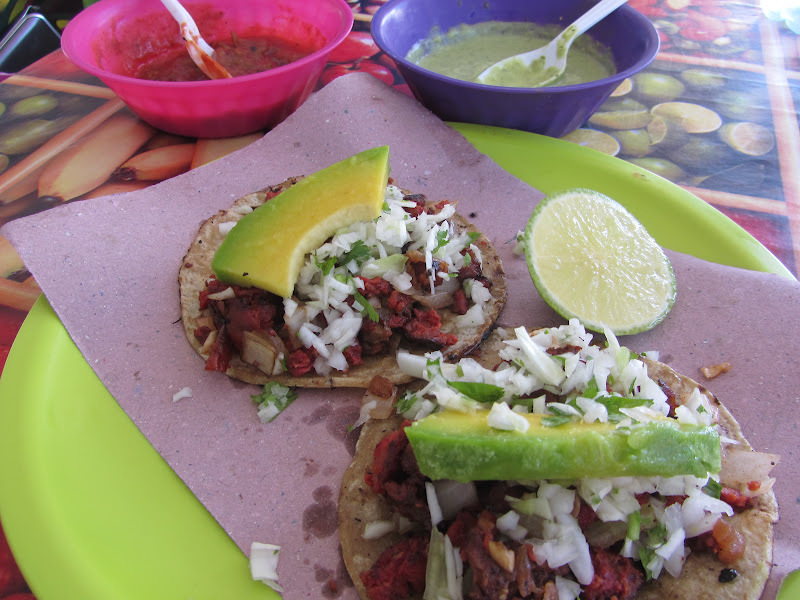 $8 pesos (about 75 US cents) each for some pork tacos. Delish. Five and a half hours later we were in Cancun. The trip is honestly super easy. And WELL WORTH making if you 1. have the time and 2. like to save $500. 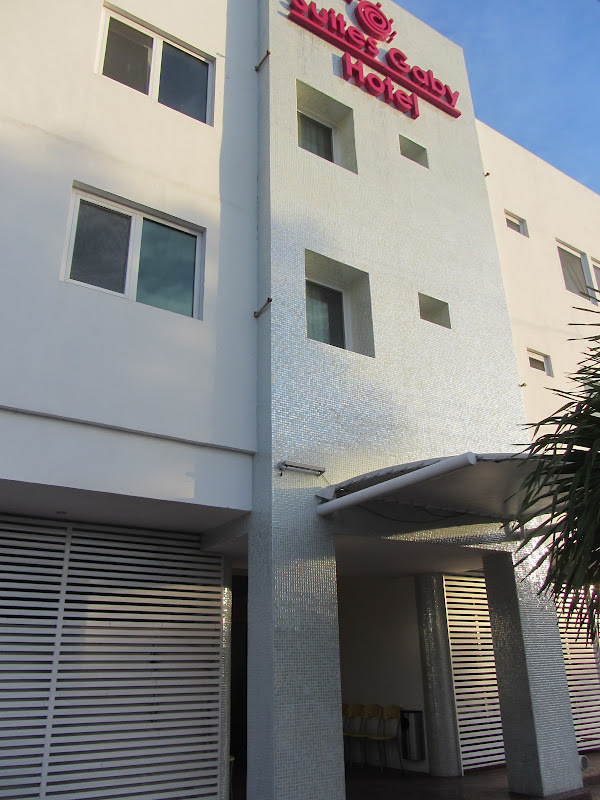 Since it doesn’t make too much sense to go out the hotel zone in Cancun (by the beach) for just one night, I randomly picked one of the city hotels close to the bus station. Here she is all of her budget glory…the Gaby Suites. At $34USD a night, you can’t really go wrong. .It was small and clean…and pretty modern with a fancy new bathroom and HUGE flat screen tv. I walked down to the street with all the cheesy karaoke bars and restaurants for dinner and maybe a margarita. 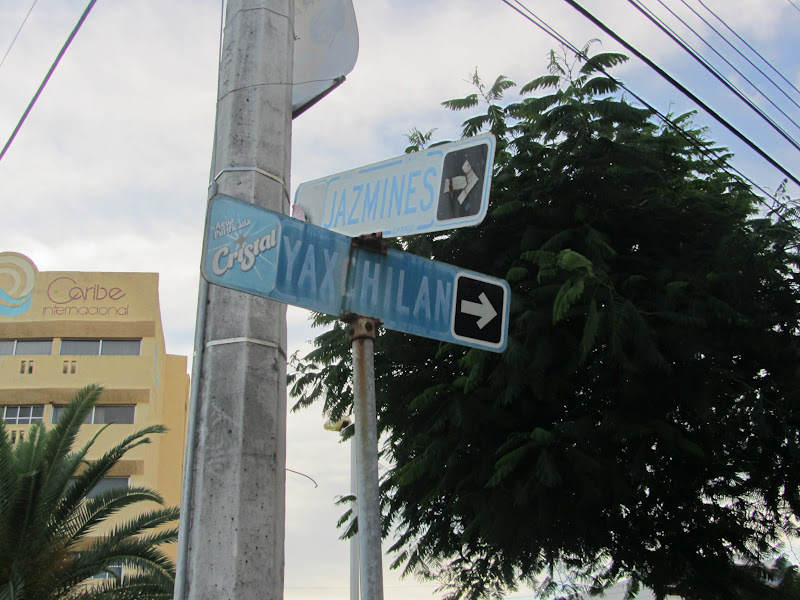 Calle Yaxchilan. 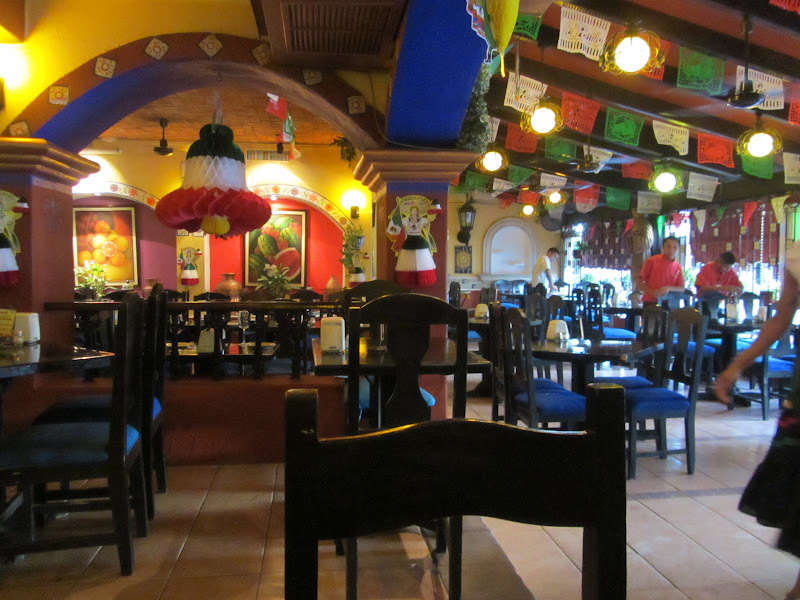 Tons of singing waiters, a mariachi band, a free welcome drink, a little trolley that they wheel around to try to pressure you to do tequila shots…I’m sure very typico Mexican. My flight to Panama City was the next morning. There is a very convenient bus from the ADO station to the airport that leaves every half hour and costs $48 pesos. I hopped on, checked in for my flights and enjoyed a Starbucks coffee and bagel. This machine was quite busy at the airport. I don’t get this thing at all. I thought your bags could be checked at any time. How can they check them if they are wrapped in 1000 layers of Saran wrap? Who are you protecting your belongings from? Is this a Central/South American thing only? An hour and a half in the Panama Tocumen airport and a very quick flight to Medellin. For a city of 3.5 million people, it is not a very big airport. 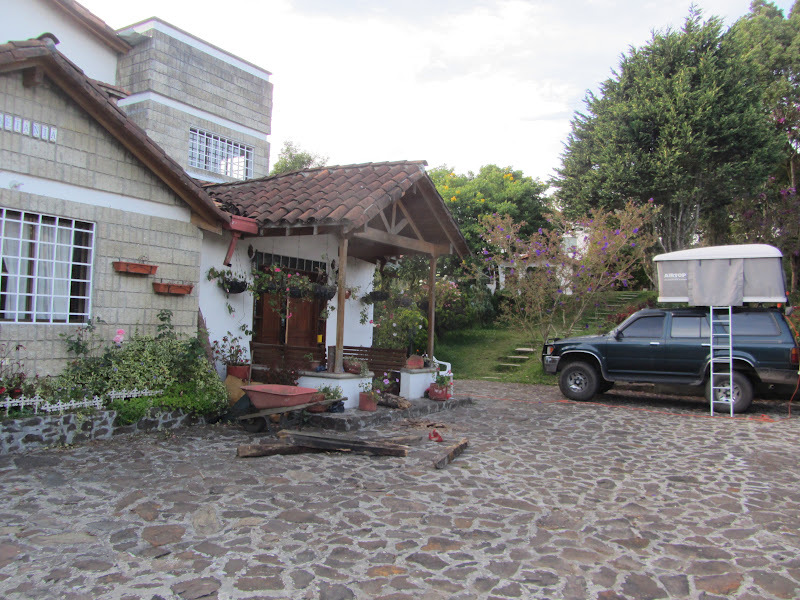 I am in Santa Elena, on of the five districts outside of Medellin. At over 7500 feet high, IT’S COLD. I’m guessing it was in the 40s or 50s last night with a very chilly breeze. I need to get used to the cold temperatures, all this greenery, the Swiss Alps look of the place and the 1,800 pesos to the US dollar. 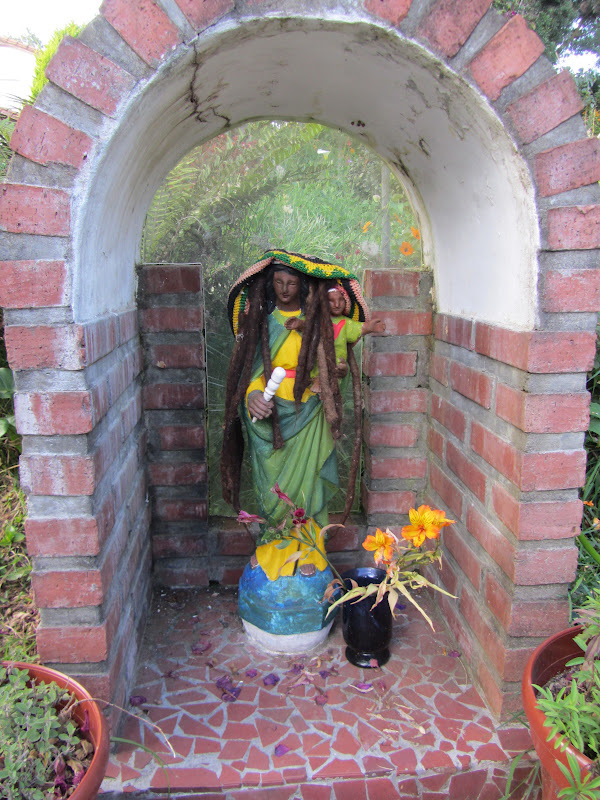 We stayed the night hostel called La Casa Colombiana…and this statue outside kinda says it all. It’s a funky hostel with people from all over the world that have been here for a week…a month…a year. Just chilling. I mean REALLY taking it easy. Though sometimes they practice juggling. The owner is a dread locked German who has lived in the area for a while. Despite the cold temperatures last night Danni and Cesar are still sleeping in their casa (on top of the truck). I opted out of my little tent and stayed in the dorm room upstairs (equally chilly). 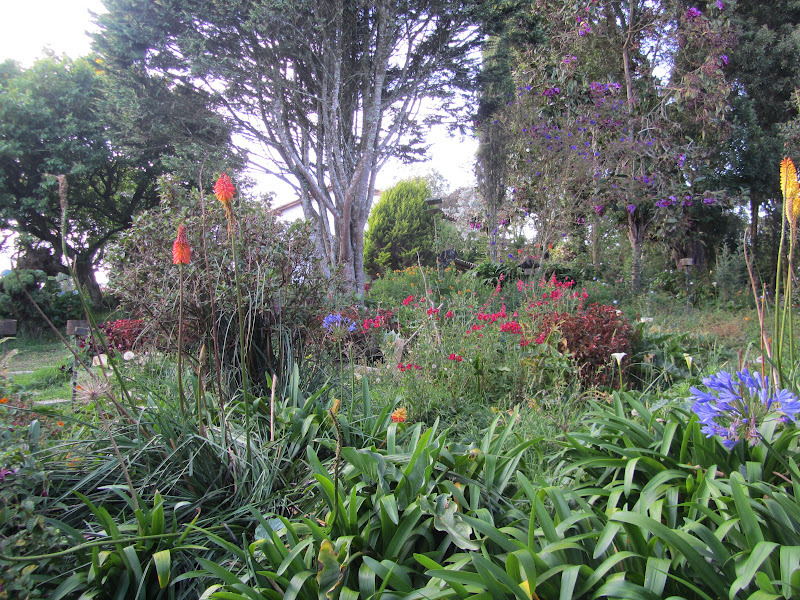 The garden is really beautiful, flowers seem to be everywhere in this town. We are headed down to Medellin today for a few nights (and promised high temperatures of 85) and then to the coffee region of Colombia which was declared a UNESCO historic area just recently. As you can imagine, I am super excited and will fill you in on all of it. Kinda interesting that we have not heard about nor read about that new exit fee anywhere until your blog! 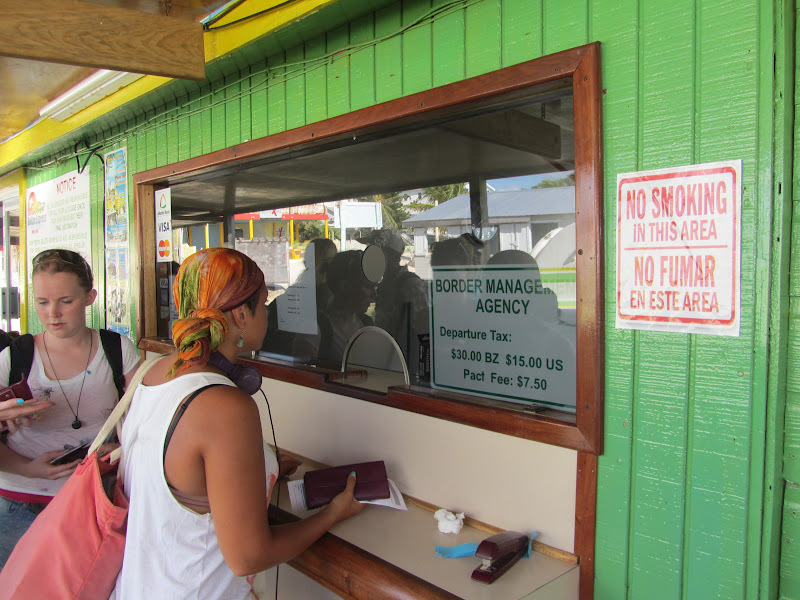 A new law or are the ferry terminal folks just pocketing the cash…like the departure fee scam that’s been running in Mexico for years? Kinda boggles the mind. Don’t think I’ll be taking a day trip to Chetumal again — it was bad enough getting out of Mexico. Thanks for the head’s up and look forward to reading more about Colombia! We first encountered the Saran Wrap mania at BZE in February. 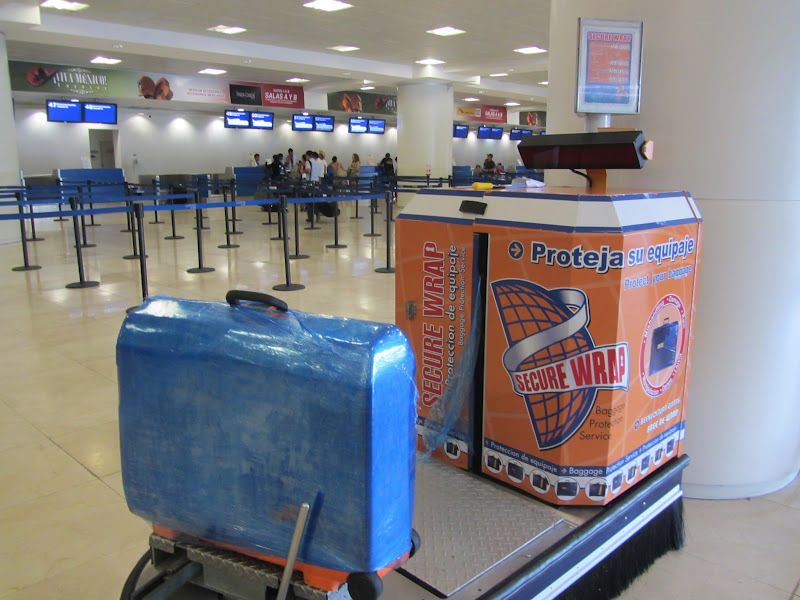 When we arrived on Tropic for our connecting flight back to the U.S., a baggage handler asked us if we wanted our bags wrapped. We thought maybe it was something to do with taking bags on boats, but now it’s all over the airports down there. It has to be a Latin American thing because I’ve never noticed it here in the U.S. I wouldn’t think Saran Wrap would offer much protection from the baggage gorillas. Columbia looks very interesting! I’ve seen that Saran Wrap practice for years. Usually CA or SA travellers – and sometimes Asians. And, if inbound to US aiports, the plastic never makes it past the first arrival airport. TSA rips it off, and usally opens every bag. I am loving your posts about COlumbia! It is definitely on my agenda! It is getting better and better. Medellin is ABSOLUTELY gorgeous. 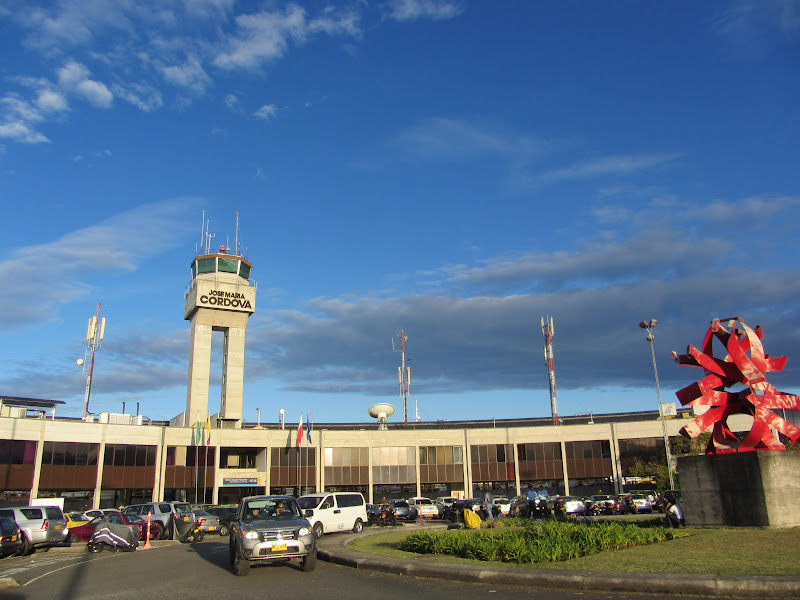 Just a quick question–did you fly on TACA from PAnama to Medellin? I flew Copa from Cancun to Panama to Medellin. Sorry to get back to you so late! I know this is an old post…just curious if the exit fee is still in place for a water taxi from San Pedro to Chetumal. Thanks!